However, due to the AAFC's poor financial situation, the league disbanded after the 1949 season. Three AAFC teams—the Cleveland Browns, the San Francisco 49ers, and the original version of the Baltimore Colts—were absorbed into the NFL in 1950. The league was briefly known as the National-American Football League during the offseason, but reverted to the traditional name of "National Football League" by the time the 1950 season began. After the NFL absorbed the AAFC, it went unchallenged by rival leagues until 1960. In 1959, Lamar Hunt, son of Texas oil magnate H. L. Hunt, attempted to either gain ownership of the Chicago Cardinals with Bud Adams and move them to Dallas, or own an NFL expansion franchise in Dallas. In 1959, the NFL had two teams south of Washington, D.C. and two teams west of Chicago (the San Francisco 49ers and the Los Angeles Rams, both in California). The league, however, was not interested in expansion at the time. Rebuffed in his attempts to gain at least part ownership in an NFL team, Hunt conceived the idea of a rival professional football league, the American Football League. In September 1959, Hunt was approached by the NFL about an expansion team in Dallas, but by then Hunt was only interested in the AFL. The new league had six franchises by August 1959 and eight by the time of opening day in 1960: Boston (Patriots), Buffalo (Bills), New York City (Titans), Houston (Oilers), Denver (Broncos), Dallas (Texans), Oakland (Raiders), and Los Angeles (Chargers). While the Los Angeles, New York, Oakland, and Dallas teams shared media markets with NFL teams (the Rams, Giants, 49ers, and the expansion Dallas Cowboys, respectively), the other four teams (Boston, Buffalo, Denver, and Houston) widened the nation's exposure to professional football by serving markets that were absent an NFL team. In the following years, this additional exposure was widened via the relocation of two of the original eight franchises (the Chargers to San Diego in 1961 and the Texans to Kansas City in 1963), and the addition of two expansion franchises (the Miami Dolphins and Cincinnati Bengals). AFL and NFL teams at the time of the merger. Following the merger, all ten former AFL teams as well as Pittsburgh, Cleveland, and Baltimore from the pre-merger NFL joined the AFC. All thirteen remaining NFL teams joined the NFC. The AFL would abolish the office of AFL Commissioner immediately and recognize the NFL Commissioner as the overall chief executive of professional football. This arrangement was in keeping with a provision of the NFL's Constitution dating from 1941 (when the title of Commissioner was introduced in football) that sought to invest the NFL's chief executive with a similar level of authority to that exercised by the Commissioner of Baseball. Following the agreement, American Football League owners created the office of AFL President with a mandate to administer the league's day-to-day business in a semi-autonomous manner, much like the way the constituent leagues of Major League Baseball operated at the time. The owners had hoped Davis would continue to serve in that role, but Davis (already furious with the owners of both leagues for negotiating a merger without consulting him) flatly refused to consider serving as a subordinate to Pete Rozelle. After Davis resigned as AFL Commissioner on July 25, 1966, Milt Woodard (who was assistant commissioner under Foss and Davis) was appointed to serve as President of the AFL. Pete Rozelle remained in his post as NFL Commissioner. Although he was not formally invested with any new title(s), Rozelle was often referred to as the football commissioner or commissioner of football in the media during the four years following the merger agreement. The pre-existing office of NFL President continued effectively unchanged following the agreement. Then occupied by Cleveland Browns owner Art Modell, the NFL presidency was (both before and after the merger agreement) essentially an honorary title that operated in a manner similar to the way in which the league presidencies of MLB operate in the 21st century. These five combinations were drawn up on slips of paper, put into a fish bowl (other sources say a flower vase), and the official NFC alignment—Plan 3—was pulled out by Rozelle's secretary. Of the five plans considered, the one that was put into effect was the only one which had Minnesota remaining in the Central Division and Dallas playing in the Eastern Division. This preserved the Vikings' place with geographical rivals Chicago, Detroit, and Green Bay, and the Cowboys' rivalries with the Redskins, Eagles and Giants. It also was the only one of the final five proposals in which there were no warm weather cities in the Central Division. More controversially, the new alignment put both of the two newest NFC franchises, the Saints and Falcons from the Deep South, with the 49ers and Rams. The Falcons had already been playing the California teams in the NFL Coastal Division, but the Saints were in the NFL Capitol Division (with Dallas, Washington, Philadelphia) of the Eastern Conference and now faced two trips to the West Coast per season. The Rams were expected to dominate the West, but the 49ers won the division in its first three seasons before the Rams won the next seven titles. Meanwhile, all three of the major television networks signed contracts to televise games, thus ensuring the combined league's stability. CBS agreed to broadcast all games where an NFC team was on the road, NBC agreed to broadcast all games where an AFC team was on the road, and ABC agreed to broadcast Monday Night Football, making the NFL the first league to have a regular series of national telecasts in prime time. The NFL would likely not have been able to retain both CBS and NBC had it not done the AFC-NFC setup. Many observers believe that the NFL got the better end of the bargain; Oakland Raiders owner Al Davis and New York Jets owner Sonny Werblin resisted the indemnity payments. Long-time sports writer Jerry Magee of the San Diego Union-Tribune wrote: "Al Davis taking over as commissioner was the strongest thing the AFL ever did. He thought the AFL–NFL merger was a detriment to the AFL." Nevertheless, despite the AFL triumphs in Super Bowls III and IV, the old-guard NFL was still widely expected to dominate the merged league over the course of an entire season. In 1970, these predictions were proven to be more or less correct, since out of 60 regular season games pitting old-line NFL teams versus former AFL teams, former AFL teams won only 19 while losing 39 (two games ended in ties). Only Oakland managed to post a winning record against old-line NFL opposition, going 3-2. Nevertheless, out of the three NFL teams to join the AFC, only the Colts managed to secure a playoff berth. The Browns and Steelers both missed out due to a stunning second-half performance by the Cincinnati Bengals, who overcame a 1-6 start and their two old-guard division rivals to secure the first-ever NFL playoff berth for a third year expansion team. Ultimately however, it was the Colts who were triumphant – they defeated both the Bengals and Raiders to become the first team to represent the AFC in a post-merger Super Bowl, where they defeated the Dallas Cowboys 16-13 to win Super Bowl V – the franchise's last NFL championship in Baltimore. Even the undefeated Miami Dolphins were slight underdogs to the old-guard Washington Redskins in Super Bowl VII; Miami won 14-7 to cap the only perfect championship season in NFL history. Not until Super Bowl VIII in 1974 was a former AFL team favored to win the Vince Lombardi Trophy, with the Dolphins trouncing the Minnesota Vikings, 24-7, to repeat as champions. Each of the first 29 games on Monday Night Football featured at least one team from the old-guard NFL; the first nationally-televised prime time game between two former AFL teams was Oakland at Houston on October 9, 1972. Eventually, the AFC teams caught and passed the NFC during the mid- to late-1970s. But even then, NFL proponents claimed that the three NFL teams that joined the AFL to form the AFC were largely the reason. However, while the Colts and Browns were respectable playoff contenders during this period, it was the Steelers who dominated the league, winning four Super Bowls in a six-year span in the 1970s. From the perspective of AFL proponents, this was not a continuation of "old NFL" dominance – before the merger, the Steelers had long been one of the NFL's worst teams, only posting eight winning seasons and just one playoff appearance (where they were shutout) since their first year of existence in 1933. They also finished with a 1-13 record in 1969, tied with the Chicago Bears for the worst record in the NFL. The $3 million relocation fee that the Steelers received for joining the AFC after the merger (along with winning a coin-flip tiebreaker against the Bears for the number one pick in the 1970 NFL draft, which ended up being future Hall of Fame quarterback Terry Bradshaw) helped them rebuild into one that could actually compete with the other "old NFL" teams. The merger paved the way for a new era of prosperity for the NFL. Since 1970 there essentially has been only one major professional football league in the United States. Other leagues such as the XFL, WFL, USFL and UFL, have never been a serious challenge to the NFL, folding after one, two, three and four seasons, respectively. While the Buccaneers joined the AFC in 1976, the Seahawks joined the NFC. 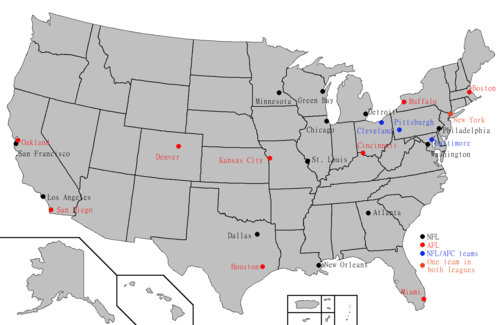 The 1976 expansion teams switched conference before their second season in the league, becoming the first NFL teams to change conferences after the merger. The Carolina Panthers and Jacksonville Jaguars were awarded franchises in 1993 and began play in the NFC and AFC respectively in 1995. Their establishment allowed the league to have divisions of equal size (six divisions of five teams each) for the first time since the merger. The Baltimore Ravens started play in 1996, as a result of the controversy stemming from Art Modell's attempt to relocate the Browns to Baltimore. Subsequent legal actions saw a unique compromise in which he was only allowed to take the players, coaches, and front office staff to Baltimore (even then, not all of them made the move), and the Browns' team colors, uniforms, and history would remain in Cleveland, inherited by the resurrected Browns franchise in 1999. Due to the three year inactivity of the Browns, the number of active NFL teams did not increase to 31 until the 1999 season. Prior to the Browns' reactivation, the NFL briefly considered re-aligning the AFC into four divisions of four teams each while leaving the NFC alignment unchanged. Due in large part to the difficulties an uneven number of divisions would have caused for scheduling inter-conference games, the proposed AFC re-alignment was shelved. As a result, the Browns were placed back in the AFC Central, which expanded to six teams as a result. The Houston Texans joined in 2002, after Houston was left without the NFL for five years following the Oilers' move to Nashville, Tennessee, where they eventually became the Tennessee Titans. The Texans' establishment made possible the realignment of both conferences into four divisions of four teams each, which allows every team to play every other team at least twice over an 8-year span (once at home, once on the road). Houston was once again placed in the AFC. To make room for the Texans, the Seattle Seahawks agreed to return to the NFC. Of the ten teams that competed in the AFL in 1969, eight have been continuously based in their 1969 market, one (the Raiders) again play in their original city after moving to a different city and one (the Oilers) no longer plays in their original city. As of 2016, all ten 1969 AFL cities still host an NFL team. Of the thirteen teams that formed the NFC in 1970, eleven have been continuously based in their 1969 market, one (the Rams) again play in their pre-merger city after moving to a different city and one (the Cardinals) no longer plays in the city it was based in at the time of the merger. Of the three 1969 NFL teams that joined the AFC in 1970, one (the Steelers) has been continuously based in its 1969 market, one (the Browns) plays in its original city after having suspended operations since the merger and one (the Colts) no longer plays in its original city. The Rams' return from St. Louis to Los Angeles ended a interval lasting 21 years in which there was no NFL team in L.A. - the longest such period involving any NFL city of the post-merger era, and resulted in St. Louis replacing Los Angeles as the only post-merger NFL city without a current NFL team. The NFL has not simultaneously fielded teams in all sixteen of its 1969 cities since the Colts relocated to Indianapolis after the 1983 season. In some cases, cities have been selected as provisional Super Bowl sites, with the construction or renovation of a suitable facility as a major requirement for hosting the actual game. In the past, New York City and San Francisco have each received provisional site awards. In both cities, the league moved the game to a different site when public funding initiatives failed. The most recent provisional site award went to Kansas City for a Super Bowl to be played in 2015 in Arrowhead Stadium, but Kansas City withdrew their request because the funding for the new roof failed in an April 2006 referendum. In May 2012 the state of Minnesota approved the construction of a new stadium, which opened for the Minnesota Vikings' 2016 season. In addition, St. Louis and Baltimore also publicly financed stadiums for the purpose of luring the former Los Angeles Rams and the first incarnation of the Cleveland Browns. The Rams returned to Los Angeles following the 2015 season. Baseball: In 1959, the Continental League was proposed by William Shea as a third major league for baseball scheduled to begin play in the 1961 season. Unlike predecessor competitors such as the Players' League and the Federal League, it sought membership within organized baseball's existing organization and acceptance within Major League Baseball. The league disbanded in August 1960 without playing a single game, as the other two leagues acquiesced to many of the owners' demands by granting franchises within the two existing leagues. In order to stop the new league, each league allowed that they would be adding two new teams each, three of which ended up in the prospective CL cities of Minneapolis–St. Paul, Houston, and New York City. All proposed CL cities, except Buffalo, would later be granted MLB teams. Basketball: In 1967, the American Basketball Association was formed with the explicit intent of merging teams with the National Basketball Association. In 1976, four of the six remaining teams of the ABA—the Denver Nuggets, Indiana Pacers, New York Nets and San Antonio Spurs—were merged into the NBA. All the teams have remained in the same media markets since entering the NBA. In 1975 and 1976, the ABA proposed a championship game between the leagues at the end of the season much like the NFL-AFL championship, but the NBA turned each offer down. Today, except for Virginia, Kentucky, Pittsburgh, St. Louis and any temporary locations ABA teams played in (including teams that were regional teams), all former ABA cities now have NBA teams. ↑ "NFL and AFL announce merger". HISTORY.com. 1 2 "How merger will operate". Milwaukee Sentinel. Associated Press. June 9, 1966. p. 4, part 2. 1 2 "How NFL, AFL will run from single wing". Miami News. Associated Press. June 9, 1966. p. 16A. 1 2 3 Schramm, Tex (June 20, 1966). "Here's how it happened". Sports Illustrated: 14. Retrieved May 21, 2016. 1 2 Maule, Tex (January 1960). "The shaky new league". Sports Illustrated: 49. ↑ "Archived copy". Archived from the original on February 3, 2014. Retrieved 2013-06-03. 1 2 "American Football League may be expanded in 1966". Nashua (NH)Telegraph. Associated Press. May 23, 1964. p. 8. 1 2 Curran, Bob (September 11, 1966). "The truth behind pro football's merger". Spartanburg (SC) Herald-Journal. Family Weekly magazine. p. 6. 1 2 Shrake, Edwin (August 29, 1966). "The fabulous Brodie caper". Sports Illustrated: 16. ↑ "The AFL–NFL merger was almost booted... by a kicker". NFL.com. ↑ "Woodard new boss in AFL power shift". Milwaukee Journal. Associated Press. July 26, 1966. p. 13, part 2. ↑ "Art Modell interim president for NFL". Miami News. Associated Press. May 27, 1967. p. 1B. ↑ Cooper Rollow (January 17, 1970). "Rozelle Lottery Leaves Bears 'Cold': Realignment Keeps Central Group Intact". Chicago Tribune. Retrieved May 21, 2016. ↑ "Secretary solves pro grid hassle". Beaver County Times. Pennsylvania. UPI. January 17, 1970. p. B3. ↑ "New Meadowlands Stadium awarded Super Bowl XLVIII". NJ.com. ↑ "Continental League of baseball announced...". rarenewspapers.com. ↑ "The Connecticut Hockey Hall of Fame and Museum – World Hockey Association History". cthockeyhof.org. ↑ "Atlanta Loses Thrashers as N.H.L. Returns to Winnipeg". The New York Times. June 1, 2011.